Randy Kohrs began playing guitar at the age of eight on his family's farm in New Virginia, Iowa. His uncle, Jack Ferguson, taught him guitar basics and Randy's desire to learn everything about the instrument carried him forward. Randy began performing at the age of 10, working with local bands and continuing to expand the breadth of his musical knowledge. His first experience as a front man was for a local Des Moines band that he played with for several years. As Randy progressed, word of his unique sound and multi-instrumental skills began to spread throughout the world of country and bluegrass. In the spring of 1997, bluegrass master David Parmley went to hear Kohrs play. By the next morning, Randy was on a bus headed for Canada as a member of Continental Divide. For the next two years, he sang tenor, occasionally singing lead, and played dobro with the band. He recorded on the album Feel Good Day, which made it to the Top 5 on the bluegrass charts and the Top 20 on the Americana charts. Shortly after recording Feel Good Day, Kohrs began touring with Holly Dunn. He also performed regularly with her at the Grand Ole Opry. In late 2000, John Cowan offered Kohrs a gig playing dobro and lap steel, as well as singing. His exceptional performance can be heard on Cowan's, "Always Take Me Back." In addition to his commanding tenor voice, Randy has also mastered a number of musical instruments, including electric guitar, mandolin, banjo, pedal steel, and bass. In 2001, Randy released his debut solo recording on Junction Records entitled "A Crack In My Armour". He later released his first full-length solo album, "Now It's Empty" on his newly created label, Left of Center Records. Kohrs accepted a gig with Dolly Parton in 2003 and for the next two years, Kohrs sang and played dobro in her band, the Blueniques. In addition to playing on three of Parton's CDs, he also performed as her opening act while on tour. In 2004, Kohrs and Parton recorded a duet, "It Looked Good On Paper", for his third album, I'm Torn, on Lonesome Day Records. It spent eight months on the bluegrass charts, rising into the Top 5. Kohrs successfully demonstrated his passion for music through the art of storytelling, which became the essential ingredient for his most powerful album, Old Photograph. Old Photograph received much critical acclaim and chart-topping success. A #1 video on CMTPure for the single, "Who's Goin' With Me", proved that the mainstream country audience welcomed his progressive acoustic sound. An appearance on the Rachael Ray Show further introduced him to the mainstream audience. In May of 2008, he made his debut appearance as a solo artist on the Grand Ole Opry, followed by a 2008 Grammy win for producing, engineering, mixing, singing harmony, and playing on Americana icon Jim Lauderdale's latest, The Bluegrass Diaries. Randy's successes as an artist, session musician, engineer, and producer have made their mark on the country/bluegrass music scene. 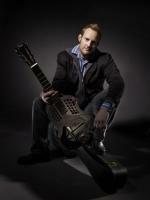 He has performed on over 500 CD's and founded Slack Key Studio, a professional recording studio in Nashville, Tennessee. Randy's determination and limitless dedication stake his claim as a first-class performer and artist. "Every once in a while, you find a company that is a cut above the rest, and Violet microphones definitely fit into that category." "Their FlamingoStandard is one of the most transparent microphones I have ever heard. It made my singer sound like he was in the room singing about 2 feet from me, acoustically." "I bought Violet's "Black Finger" and it is now a permanent fixture, set up in my studio to mic an upright Bass." "With microphones suited to fit any budget, Violet can accommodate and immediately raise the caliber of any size studio. I am looking forward to trying the rest of the series myself !"